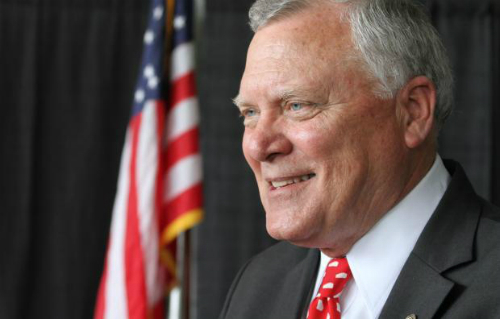 Georgia Governor Nathan Deal signed into law Wednesday a bill that allows Georgians with concealed carry permits to take their licensed firearms into bars, nightclubs, airports, government buildings, churches — yes, churches — and, of course, schools. Yes, school boards could allow K through 12 teachers to carry firearms in their classrooms. Because who needs an apple when you have a 9 millimeter? And this was the watered-down version of the bill. Deal said the law allows “people who follow the rules [to] protect themselves and their families from people who don’t follow the rules.” Yes, because what group has more people that don’t follow the rules than the third grade? Those kids never sit down when you tell them to. Well, let’s see what they do when they have a loaded handgun in their faces. They’ll sit down then. In fact, they’ll probably pee their pants. Pussies. Supposedly, the idea is for school staff to carry a gun to protect students from attack by a gunman or some other similar event. But the law’s provision allowing guns on college campuses was considered “too controversial” and was taken out of the bill. So, guns around the toddlers, fine, but not around the 20-year-olds. Not that I want guns on college campuses, but what exactly is the logic here? Or is it time to say we’re just done with logic, as a country? We tried it, it didn’t work for us. We’re over it. We’re post-logic now. Elsewhere, the law states that Georgians with conceal carry permits can carry guns into bars, as long as they don’t consume alcohol. And how will that be enforced, exactly? Who’s going to stop the armed person from drinking? They have a gun, and they want a drink — they’re getting a drink. Oh, I forgot, the bartender and all the other patrons will be packing, too. So, it should work out fine, then. Never mind. The group Georgia Carry, which lobbied for the bill, posted a message on its website that said, while it’s happy about the bill, there’s still fighting to do (ideally, with bullets). “One day,” the message said, “we’ll get all our rights back.” Really? What rights don’t you have? You can buy pretty much any gun you want, you can carry it pretty much anywhere, and you can even shoot someone, as long as you have a “reasonable belief” that your life is in danger, and the other person is a minority. I’m missing the part where your rights are under attack. 70% of Georgians oppose parts of the bill, like allowing guns in bars, but what does that matter? Lawmakers are owned by the NRA and the pro-gun lobby, which means the Second Amendment trumps everything else in this country — access to guns is way more important than access to affordable health care. And it isn’t just Republicans who are to blame. Jimmy Carter’s grandson, Jason, who is the Democratic candidate for governor in Georgia, also voted for the bill. It’s almost as if the NRA folks have a gun to legislators’ heads. Well, why not? It’s legal in government buildings now. BYOG!